Trammel Fork and Middle Fork of Drakes Creek rise in the northern Highland Rim area along the Tennessee border in Allen County. The two forks flow into Warren County where they meet the main stem of Drakes Creek that drains into Barren River near Bowling Green. The gravel substrate of Trammel Fork, Middle Fork and Drakes Creek allows floodwaters to carve holes of varying depths, reminiscent of the world famous blue ribbon smallmouth streams of the Arkansas and Missouri Ozarks. The Drakes Creek system is vastly different water than smallmouth streams flowing through the limestone sections of Kentucky where the water is rarely over an adult’s head. Trammel Fork, Middle Fork and Drakes Creek also hold largemouth bass, spotted bass, rock bass, bluegill and a few muskellunge. Fisheries personnel with the Kentucky Department of Fish and Wildlife Resources routinely see smallmouth bass from 15 to 18 inches long in this system. Trammel Fork, Middle Fork and Drakes Creek also have many riffles that make the paddling interesting, but are easy enough for beginners and families. Western Kentucky University has a helpful website for paddlers on the Drakes Creek system called the Warren County Blueways at www.wku.edu/blueways. The website features an interactive and printable map with GPS coordinates, locations of put-in and take-out locations, floating mileages and other important information along with links to participating partners. 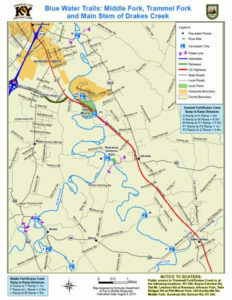 This map corresponds with brown metal markers at the put-in and take-out locations on the river to avoid confusion and also on the map that accompanies this article. In its journey from its spring-laden headwaters to its confluence with Drakes Creek, Trammel Fork has deep holes, gravelly shoals and riffles that make ideal habitat for smallmouth bass. The first float on Trammel Fork of Drakes Creek begins near the Warren and Allen County line at the KY 240 Bridge on Woodburn – Allen Springs Road and ends two miles downstream at Boyce – Fairview Road Bridge in Warren County. Limited parking exists at the put-in at the KY 240 Bridge. Trammel Fork in this section has many long, moderately deep holes interspersed with gravel bars and braided stream drops. 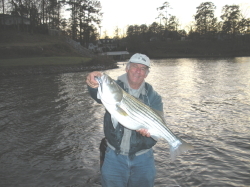 This float makes an excellent half-day float for anglers pursuing black bass, rock bass or sunfish. The second float begins at the Boyce – Fairview Road Bridge and ends five and one-half miles downstream at Romanza Johnson Park on Mt. Lebanon Road in Warren County. This float makes an excellent full-day float for those who plan to fish and half-day float on a straight paddle. Boaters may put in at the KY 240 Bridge and paddle to Romanza Johnson Park on Mt. Lebanon Road for a seven and one-half mile float. Those who plan to fish should put in early in the morning and plan to take out at dusk on this stretch. Fly rod anglers interested in smallmouth bass should try the Middle Fork of Drakes Creek. The Middle Fork is much smaller and intimate compared to Trammel Fork and offers excellent opportunity for fly casters to present black deer hair poppers and larger chartreuse cork poppers to woody cover in the flowing shoals and above and below riffles. The top-water bite grows stronger as the days shorten and water cools in September. Kayaks provide access to miles of good fishing on the forks of Drakes Creek near Bowling Green, Kentucky. Due to its small stature, deadfalls blocking the stream can be a problem on the Middle Fork and may require some portaging, especially after high flow periods. The put-in for this float is on Goodrum Road in Warren County for a nearly four-mile paddle to the KY 240 Bridge on Woodburn – Allen Springs Road near the community of Drake. Parking for several vehicles and an easy carry down at the Goodrum Road access awaits boaters. However, the KY 240 Bridge access has limited parking and presents a long carry over private property that requires landowner permission. Paddlers can shorten this float to about three miles by putting in at the ford on Duncan Road, also known as White’s Chapel Road. The next float is on the main stem of Drakes Creek. It begins at the KY 240 Bridge near Drake and concludes roughly five miles later at Romanza Johnson Park. Boaters need to paddle a short distance up Trammel Fork to the park which enters Drakes Creek on the right. This section of Drakes Creek has many sharp turns that create flowing outside bends that hold smallmouth bass. Target these areas with a 4-inch black double-tailed skirted grub on a 3/16-ounce standup leadhead. Larger smallmouth bass prefer this presentation. This stretch also features many sandbars slightly under water. Swim a 3-inch green pumpkin-colored curly-tailed grub just over bottom in these areas for smallmouths. Grubs really shine on hot days during low flow periods. The next float begins at Romanza Johnson Park and ends about six miles downstream at Phil Moore Park in U.S. 231 near Bowling Green. This stretch is perfect for paddlers who want to spend a day on the water without worrying about time or difficulty of paddling. Both of these parks close at dusk. Drakes Creek widens and deepens in this stretch and the same outside bends hold smallmouth bass, but anglers should also work the woody cover in the slower holes for spotted and largemouth bass. A pearl-colored weightless soft plastic jerkbait draws strikes when slowly worked alongside the submerged wood. A four-inch black finesse worm rigged on a 1/16-ounce leadhead and allowed to slowly fall beside this cover is also a deadly tactic for these fish. Two take-outs await paddlers at Phil Moore Park. One is on the left just upstream of the U.S. 231 Bridge. Warren County Parks and Recreation installed a concrete pad for paddlers to land boats and gain their footing in current before ascending the steps to the parking area. The other take-out is about one mile downstream around a bend to the left. Look for a small set of concrete steps. The last float on Drakes Creek begins at Phil Moore Park and ends about five miles downstream at the KY 2629 Bridge on Old Scottsville Road. The KY 2629 Bridge access has extremely limited parking and a long carry. Do not block the farm gates while parking vehicles here. This section flows much more river-like and holds good numbers of largemouth and spotted bass. Anglers should also target sunken brush and tree tops for surprisingly large bluegill. This section also holds some large muskellunge that migrate upstream from Barren River. Fish flooded timber with a large black and gold minnow-shaped crankbait for muskellunge. Paddlers should consult the Drakes Creek near Alvaton, Kentucky gauge on the Kentucky Streamflow page at the U.S. Geological Survey’s website at www.waterdata.gov. For Trammel Fork and Drakes Creek, flows of at least 100 cubic feet per second (cfs) are best for minimal dragging with a 150 cfs minimum for the Middle Fork. Anglers can float these at lower flows, but expect to drag. The upper stretch of Trammel Fork at the Concord Church Road Bridge and Blankenship Road Bridge in Allen County offers excellent wade fishing for trout at these two Kentucky Fish and Wildlife Voluntary Public Access Sites. Springs feeding Trammel Fork drop the water temperature low enough for trout to survive year-round. Scottsville and Allen County offer plenty of antiquing for visitors to accompany paddling the Drakes Creek system. Both Allen and Warren counties’ strategic location on the main transportation routes from Louisville to the interior of the South provided much Civil War action in the area. This entry was posted in kayak fishing, Where To Fish on January 3, 2019 by ronniegarrison. The vast majority of northern bass anglers hang up their open-water gear for the winter. With most lakes under inches (if not feet) of ice by January, most fishing involves an eight-inch hole in the ice. 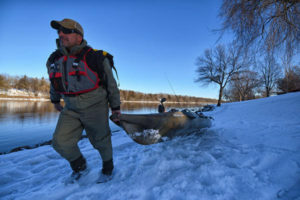 “You have to look hard in the northern states, but there are places to fish bass during the winter in open water,” says Minnesota-based kayak angler Paul Hansen. Funny thing about Hansen, he has plenty of access to open-water fish during the worst of Minnesota’s winters. As a commercial airline pilot, he’s often free to explore waters during layovers in southern climes – something he’s been doing in one form or another for almost two decades. In fact, he reluctantly admits fishing was the impetus to learn how to fly. “After working long hours in fishing retail, I knew there had to be a better way. If I could make it through pilot’s training and build up hours and experience, I could eventually create a business to fly adventure anglers into really cool destinations, which selfishly appealed to me,” says Hansen. Turns out Hansen took to flying as naturally as he did to fly casting, and in the year 2000, he and legendary fly angler/travel partner Trapper Rudd started an exploratory kayak fishing program. “We put kayaks on an airplane and brought them to Mexico. We had fished all the popular destinations and set out to find untouched snook, tarpon, and bonefish by kayak. We found some epic fisheries that wouldn’t have been accessible without kayaks. This led to years of great adventures, like the stuff I read about in magazines as a kid,” says Hansen. Still, as a competitive kayak angler who frequently competes in both the Kayak Bass Series (KBS) and Kayak Bass Fishing circuit (KBF) tournaments, there are times when Hansen gets antsy during long Minnesota winters. Having qualified for the KBS Nationals on Lake Guntersville, Alabama, this past September, Hansen says he feels the need to stay at the top of his game despite Minnesota’s harsh winter weather. “There are warm-water effluent areas throughout the frozen north that offer an open-water alternative to ice fishing. And some of the smallmouth bass fishing is pretty phenomenal,” says Hansen. Just minutes from his Twin Cities, Minnesota home, the warm-water discharge from power plants on the St. Croix River and Mississippi River offer some legendary winter smallmouth bass fishing opportunities. Depending on the conditions, Hansen employs the use of two specific fishing kayaks, both designed and manufactured in the USA by Maine’s Old Town Canoes & Kayaks, a company with over 100 years in the watercraft business. But Hansen admits that sometimes finding smallmouth pods can be a challenge. And even when you find them, it all comes down to just the right presentation. The first thing Hansen looks for are areas that retain heat. As cold-blooded creatures, smallmouth bass will only expend as much energy as the water temperature allows. The biological imperative is to conserve energy; when water temperatures are low, bass will move less. As water temperatures climb, bass activity increases. Current also plays a big part in locating winter smallmouth bass. Winter smallmouth bass are typically found adjacent to current areas, only moving into fast water to feed when absolutely necessary. More often the case, winter smallmouths relate to slack-water areas just off current seams and eddies. Anywhere that current naturally pushes food is a sure bet. Such areas are visible to the naked eye. Left to his druthers, Hansen typically reaches for a fly rod, but has found better odds with unique, hybrid techniques that merge his experience with fly and conventional angling. Conventional spinning tactics like a jig and minnow also introduce drag. Go too heavy in jig weight to reduce drag and you’ve got the hassle of snagging in the crevices of river rock. “A centerpin outfit gives me the perfect drift. Due to the rod length and the entire system, the drift is longer, slower, and more precise. It allows a very natural presentation. You want split-shot placement that’s appropriate for the current and allows the minnow to float along so it slowly rolls in front of the fish and they can’t resist,” says Hansen. To that end, Hansen uses a St. Croix Avid 13’ ML power, moderate action center-pin rod with a Raven centerpin reel loaded with 10-pound braid. He attaches an 8 lb. Seaguar fluorocarbon leader to the main line, places small split-shots evenly below a steelhead float, and uses a small circle hook to prevent gut-hooking. There are times when Hansen goes artificial-only—like during the classic January thaw when temperatures can rise well above the 32-degree mark. For situations like this, Hansen leaves the centerpin rig in the rod holder, and throws baits on a versatile 7’1” medium-power, fast-action St. Croix Legend Bass Tournament spinning rod and Daiwa spinning reel spooled with 8- to 10-pound Seaguar InvisX fluorocarbon. Any time you’re fishing in winter—whether on the ice or open water—safety should be your first priority. Navigating rivers in winter can be dangerous. Ice floes are not uncommon, even in areas with warm-water effluent. Shouldn’t impact with an ice floe knock you out of your kayak, a PFD and spare clothes can save you from drowning and hypothermia. Stuck with cabin fever or mid-season ice fishing burnout? In need of an open-water bass adventure? Hansen encourages anglers to investigate local rivers. Find warm-water discharge from a power plant, water treatment facility, or other industry, and you’re in business. Employ a kayak to get beyond the bank, learn to execute a perfect drift, experiment with live and artificial baits, and you might just be amazed by the hot bass bites possible in the dead of winter. This entry was posted in kayak fishing on February 23, 2018 by ronniegarrison. If big game fishing in world-renowned billfish waters wasn’t enough, Old Town’s David Hadden and Sport Fishing editor Doug Olander took it one step further, hauling Old Town Predator PDL kayaks some 40 miles offshore, “mothership fishing” from one of Casa Vieja’s charter boats under the expert direction of Captain Chris Sheeder. Although Hadden’s no stranger to big fish like tarpon and tuna, his first Pacific Sailfish pushed the limits of what he’d accomplished from an Old Town Predator PDL kayak. Drag tightened and a quick fight routine dialed in, sailfish releases from the Old Town Predator PDL jibed well with Casa de Vieja’s catch and release conservation program. “Casa Vieja takes the ‘The Billfish Capital of the World’ designation seriously, protecting all billfish to fight another day. That was the beauty of Predator PDL kayaks; we could hold the bill with one hand and pedal and revive the fish after the fight. That might have been the most satisfying part,” says Hadden. Along the way, Hadden and crew planted their flag in some new angling territories, including being the first anglers to fish sailfish from pedal-driven kayaks 40 miles off Guatemala’s Pacific coast. And on the last day, they pioneered a unique play that merged charter boat outrigger teaser bait tactics with precise kayak angler boat control and bait placement. Sailfish anglers will often use long outrigger poles when trolling to place baits high in the water column off both sides of the boat. When a sailfish is teased up on an outrigger bait—essentially used as a decoy—they’ll quickly pull in the outrigger and line and use a rod to flip a bait to the fish. Familiar with the latest in kayak fishing tactics, techniques, and trends, Hadden believes he and Captain Chris were the first to attempt precise pedal-driven kayak boat and bait placement in tandem with a trolling charter boat on an outrigger-teased sailfish. While Johnson Outdoors Watercraft manufactures numerous kayak models suitable for saltwater big game fishing, the Old Town Predator PDL has quickly become a favorite with anglers. “It all comes down to the hands-free fishing experience the rugged and efficient Old Town PDL Drive provides. Especially with fighting any kind of big billfish species, having forward and reverse right at your feet is a huge asset for controlling the fish. Trolling and deploying baits is also made that much easier than having to work a paddle. Of course, the PDL Drive itself is built for saltwater use and the 10.3:1 gear ratio allows speeds up to 5.5 mph for reaching and returning from distant spots quickly and efficiently,” says Hadden. In terms of tackle, Hadden and company fished live blue runners on circle hooks with 80-pound Seaguar braid main line and an 80-pound Seaguar fluorocarbon leader. Once to the lodge, Hadden and crew were met with first-class accommodations. “The lodge was as nice as anything in the Bahamas. Fine cuisine and a great beer, scotch, and rum selection. Five-star all around, but what really impressed me was their staff. To learn more about Guatemala’s legendary billfish angling, visit www.casaviejalodge.com. Want to win a brand new Predator PDL, St. Croix Legend Tournament Inshore rod, plus lots of other St. Croix and Old Town gear seen in the video? JOHNSON OUTDOORS WATERCRAFT RECREATION includes Old Town canoes and kayaks, Ocean Kayak, Necky kayaks, Carlisle paddles and Extrasport personal flotation devices. Old Town canoes and kayaks have created genuine watercraft with innovative designs for over 100 years. This entry was posted in kayak fishing, Saltwater Fishing on November 30, 2017 by ronniegarrison.